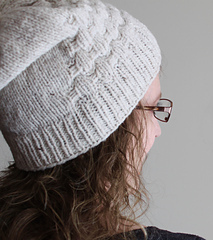 This slouchy hat is naturally asymmetrical, giving it a unique shape and style. 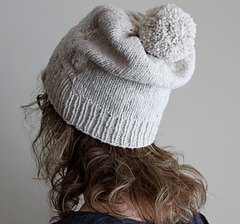 The easy slipped stitch pattern gradually decreases to a peak at the top of the hat while the stockinette section grows. This creates the perfect amount of slouch. This pattern is worked in the round. The stitch pattern is written and charted. 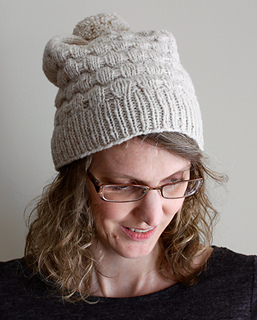 The Gratification Hat is the fifth and final pattern in the Winter Comfort Collection which also includes the Contentment Cowl, Sustenance Scarf, Indulgence Wrap, and Tranquility Infinity Scarf. This is a collection of 5 cold weather accessory patterns in neutral colours and natural fibres. 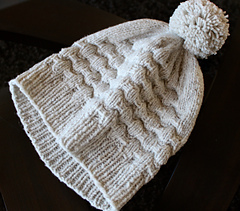 This pattern uses 2 skeins of Brooklyn Tweed SHELTER. The colour shown here is Fossil. If substituting yarn, approximately 210 yards of any worsted weight yarn is required. Finished Measurements: Fits approx head circumference of 21 - 24 inches (53 - 61 cm). 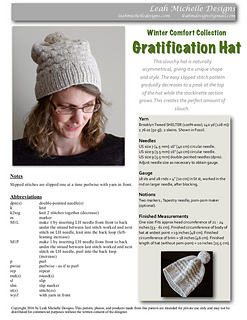 Finished circumference of body of hat at widest point = 19 inches (48 cm). Finished circumference of brim = 18 inches (46 cm). 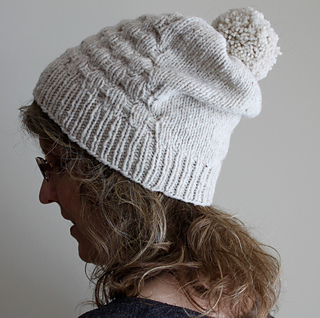 Finished length of hat (without pom-pom) = 10 inches (25.5 cm). Skills required: Working in the round, increasing, decreasing, making a pom-pom (optional). Stitches used: k, p, sl pwise wyif, M1L, M1P, k2tog. Learn to make pom-poms with this pom-pom making tutorial at leahmichelledesigns.com. 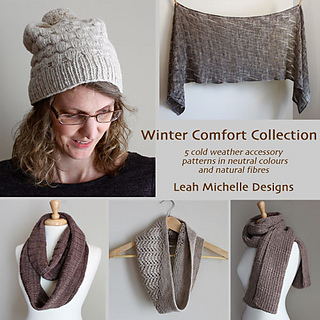 Subscribe to the Leah Michelle Designs newsletter for pattern announcements and subscriber-only discounts.